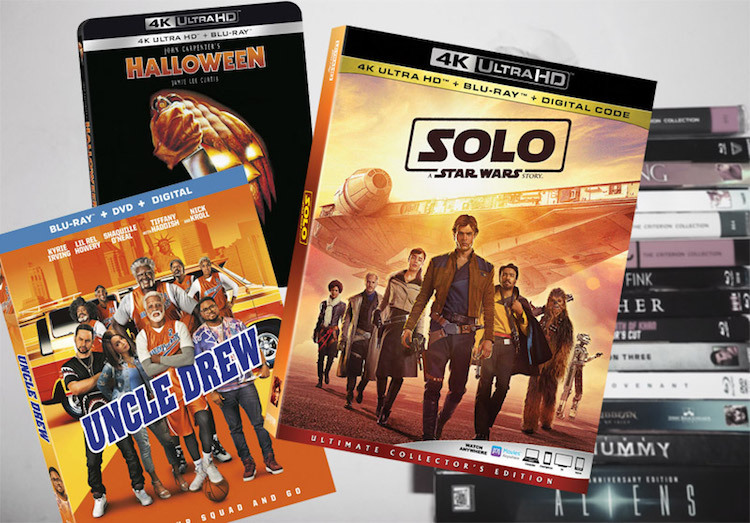 Welcome to Mandatory and ComingSoon’s Digital HD, Blu-ray and DVD column for the week of September 25th! You can find detailed write-ups of different titles below! Although it disappointed at the box office, there is much to love in Ron Howard’s scrappy Star Wars prequel about the early days of everyone’s favorite scoundrel. Worth a revisit on Blu-ray! Desperate to win the tournament and the cash prize, Dax (Lil Rel Howery) stumbles upon the man, the myth, the legend Uncle Drew (played by a hilariously disguised NBA All-Star Kyrie Irving) and convinces him to return to the court one more time along with his rag tag crew of geriatric ballers. The true story of John V Gotti (John Travolta) and his rise to power to take the mantle of boss of the Gambino crime family. Is it as bad as its 0% rating on Rotten Tomatoes? See for yourself… or don’t. The classic Full Moon franchise gets a bloody and fun reinvention from the newly relaunched Fangoria film division. This time instead of fighting Nazis the puppets ARE Nazis. Click here to read our previous interview with star Thomas Lennon! Timothée Chalamet and Maika Monroe star in this story of a sheltered teenage boy during a wild summer he spends in Cape Cod getting rich from selling pot to gangsters, falling in love for the first time, partying and eventually realizing that he is in over his head. A small group of town residents have to band together after a devastating ground invasion by aliens. Dan Ewing and Temuera Morrison star. Willem Dafoe provides a narration for director Jennifer Peedom’s symphony of mountaineers, ice climbers, free soloists, heliskiers, snowboarders, wingsuiters and parachuting mountain bikers. The day before Katherine’s wedding, the friction between Ellie and her stressed-out mom turns into an argument, during which a precious hourglass gifted to Ellie by her dad suddenly shatters, causing them to magically switch bodies in this new remake of the Disney classic. Tracing the life of a renowned painter, the second feature by Andrei Tarkovsky vividly conjures the murky world of medieval Russia. The Criterion Collection Blu-ray includes new 2K digital restorations of both the director’s preferred 185-minute cut as well as the original 205-minute version of the film, The Passion According to Andrei. In 2007, two talented Spanish filmmakers created a terrifying film that went on to spawn three sequels, an American remake and its sequel. Now you can get all four of the original Spanish films in one box set from Scream Factory! Bizarre nightmares plague Regan MacNeil (Linda Blair) four years after her possession and exorcism. Has the demon returned? John Boorman’s much-despised sequel that is nonetheless full of bold, daring ideas is ripe for reappraisal in a 2-disc set that includes both the 117-minute and 102-minute versions, along with a new commentary by the late Boorman. Frankenstein builds the perfect woman (and lives to regret it) in this tantalizing marriage of horror, romance, and unbridled passion! Rock legend Sting plays the cunning scientist and Jennifer Beals (Flashdance, The L Word) lends her dramatic presence as his supreme, sublime creation. Still traumatized by the loss of her husband, well-meaning social worker Ann Gentry throws herself into her latest assignment: the case of Baby, a 21-year-old man with the mind of an infant who crawls, cries and has yet to make it out of nappies. One of the most bizarre horror films ever made is a MUST-OWN for genre fans, many of whom will not see the shock twist ending coming! Screen icons Burt Lancaster (Elmer Gantry), Tony Curtis (The Vikings) and Gina Lollobrigida (Woman of Straw) form a troubled love triangle in the realistic, suspenseful 1956 film shot in the actual Cirque d’Hiver in Paris. Screen legend Lee Marvin is Great Scout, Kay Lenz is Cathouse Thursday and with a little help from their friends (and enemies), including Oliver Reed, Robert Culp, Sylvia Miles, Strother Martin and Elizabeth Ashley, they’re out to take over the lusty world of modern Colorado in 1908. A group of friends decide to repair and renovate an old house located in the middle of nowhere in the hope of turning it into their ‘cool’ crash pad, but soon find themselves up against a very unexpected geriatric evil, hell-bent on keeping them as permanent residents in ‘her’ house, dispatching them in a series of creatively gruesome ways. In her semi-autobiographical directorial feature debut from 2000, Asia Argento plays Anna Battista, a rising young actress who, despite her popularity and success, experiences despair and degradation at the hands of an abusive industry. Harvey Weinstein’s fingerprints are all over this. The night HE came home to 4K! Before the new film comes out, revisit John Carpenter’s landmark 1978 slasher flick in a stunning new transfer with bold sound for the most immersive home version yet. Now Marvel Comics fans can take home both the 2004 Thomas Jane origin story of The Punisher as well as the neon-colored crazy town reboot from 2008 starring Ray Stevenson in 4K. Which one you prefer will vary depending on your preference for fidelity to the comic book or loony B-movie action. Bryan Singer’s 2000 original X-Men, his 2003 sequel X2: X-Men United and Brett Ratner’s 2006 X-Men: The Last Stand arrive on 4K with a splash in this 3-disc box set. The violent, controversial 2000 film that helped launch Christian Bale to superstardom is now on 4K in all its uncut glory. Two old friends take their daughters on vacation, but things get complicated when one of the girls seduces her dad’s friend after a night out. How long will the secret stay hidden? It’s the Summer of ’87, and Gio (Spencer Boldman), an Italian kid from Queens, has little on his mind but cars and girls. Gio thinks he’s got it all figured out until he meets Jessica (Emily Ratajkowski), a nice Jewish girl from Long Island who likes to go undercover for illicit thrills on the wrong side of the tracks. An affectionate look at the youth culture of a bygone era, the film celebrates the joys of muscle cars, Motorola pagers and endless summer nights. The animated series from 1987 based on Jim Henson’s beloved Muppet TV show comes home to DVD for children of all ages to enjoy. Season 3 finds Chuck Rhoades and Bobby Axelrod in a world that has shifted on its axis. Both men are still determined to destroy the other, but must also battle for their own survival amidst new forces and powerful enemies. This new season explores incredible new developments in the search for extraterrestrial contact in our distant past and even today. Wealth, power, deception, and double-dealing… what does it take to build a dynasty? A modern re-imagining of the iconic primetime soap centering on the powerful Carrington family as they defend their throne against the Colbys, their well-coiffed new rivals, and even each other. Charismatic but conceited Victoria “Sando” Sandringham made a name for herself as the “package deal queen” of her furniture empire. But after an outrageous indiscretion at the wedding of her daughter, Susie, Sando’s family cut her out of their lives. Ten years later, Sando is being forced out of her company, too. With nowhere to go, she tries to worm her way back into her family’s good graces, but they have problems of their own.